Our February 2018 purse and shoe sale is coming up this weekend! 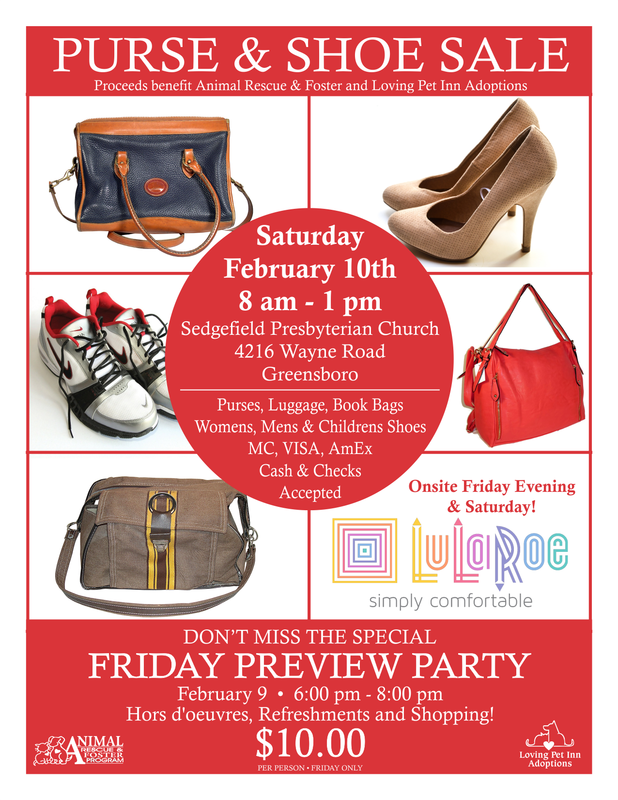 The sneak peek preview sale will be Friday night from 6-8 pm at Sedgefield Presbyterian Church at 4216 Wayne Rd in Greensboro. It’s $10 to get in to the Sneak Peek sale, which not only gets you first crack at all the purses, bags, and shoes we have for sale, but also gets you beverages and hors d’oeuvres to keep you going strong while you shop! Saturday’s sale starts at 8 am and goes until 1 pm. There’s no charge to get into the sale on Saturday — which means you’ll have even more money to spend on bags and shoes! LuLaRoe will also be in the house both days with their super comfy clothes — perfect for finding a new outfit (or two!) to go with your new accessories. As always, proceeds from the shoe and purse sale benefit ARFP and Loving Pet Inn Adoptions, to help both groups rescue and provide medical care for more homeless pets.